When a data model is loaded, the Database Builder creates a set of logical folders, one for each object type supported by the current DBMS. Each logical folder is populated with all objects of that type found in the data model's hierarchy of Packages (as shown in the Project Browser). In this image the data model 'Orders (postgres)' shows logical folders for Tables, Views, Functions, Sequences, Queries and Connections. It is worth noting there is no folder for 'Procedures' since PostgreSQL does not support database procedures. 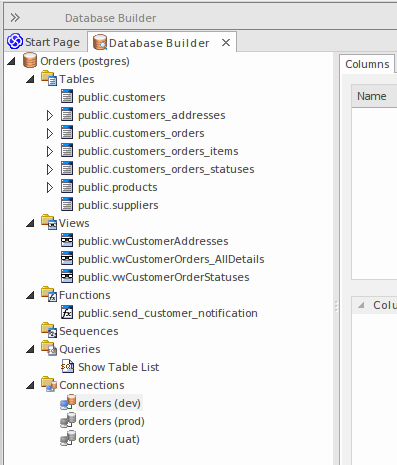 The majority of the Database Builder functions are accessible via context menus. Each object in the Tree has its own set of unique menu items based on its type and status. This table describes the available context menu items and identifies which objects they apply to. Description: Opens the Model Wizard screen. Description: Reloads the complete list of data models. Description: Loads the full details of the data model. Description: Unloads the full details of the data model. Description: Opens the 'Import DB schema from ODBC' dialog using the current active connection as the ODBC source. Description: Opens the 'Generate DDL' dialog with the current object(s) selected. Description: Compares the selected objects to the current active connection. Description: Compares the selected objects to the current active connection and optionally ignore some of the differences based on the specified compare options. Description: Opens the 'Manage DBMS Options' dialog, which can be used to change the allocated DBMS and Owner of multiple objects. Description: Builds and runs a SELECT query (formatted to suit the element's DBMS) to show the number of records in the selected Table or View. If there is no active connection, you are prompted to select one. Description: Builds and runs a SELECT query (formatted to suit the element's DBMS) to show the top 100 rows of the selected Table or View. Description: Builds and runs a SELECT query (formatted to suit the element's DBMS) to show the top 1000 rows of the selected Table or View. Description: Builds and runs a SELECT query (formatted to suit the element's DBMS) to show all rows of the selected Table or View. Description: Opens the standard 'Properties' dialog for the selected object. Description: Finds the selected object in the Project Browser. Description: Reloads the details of the current loaded data model. This is necessary when objects are added, changed or deleted by other users or when the changes are performed outside of the Database Builder. Description: Creates a new object of the specified type. Description: Makes a new copy of the selected object. When you select this option, a prompt displays on which you set the name and owner of the new object. For Table objects, you can choose which existing constraints should be copied (and set a name for each one) along with which Foreign Keys should be copied. For SQL-based objects, you can make any necessary changes to the SQL for the new element. Description: Permanently deletes the selected object from the repository. Description: Creates a new relationship between the selected Table and another one, then shows the 'Foreign key Constraint' screen for the new relationship. Description: Opens the 'SQL Object Editor' screen. Description: Loads the SQL (as defined in the selected element) into the SQL Scratch Pad. Description: Loads the SQL in the SQL Scratch Pad and runs it. Description: Flags the selected Database Connection as the active one for the current session. Description: Flags the selected Database Connection as the active one each time the data model is loaded. Description: Opens the 'Database Connection Properties' screen, to manage the connection settings.